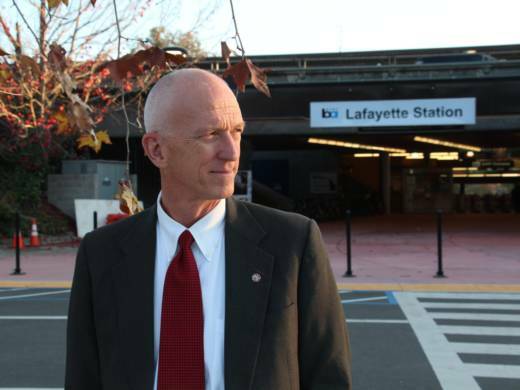 Steven Falk still remembers the moment he first laid eyes on Lafayette, California, even though it was 28 years ago. He was driving there to interview for a job as an assistant to the city manager. The 25,000 people of Lafayette live close to nature, yet they can step onto a commuter train and be in downtown San Francisco in half an hour. "It seemed like I had reached some kind of paradise," Falk says. The median home in Lafayette is worth over a million dollars. The people are educated and environmentally aware. They voted three-to-one for Hillary Clinton in 2016. For the last 22 years, Steven Falk has been their city manager, more or less the CEO of local government, responsible for everything from police to potholes. Then, in 2005, he read Elizabeth Kolbert's three-part series of articles in the New Yorker about global warming. "They scared the daylights out of me," he says. He started noticing evidence of climate change himself. For instance, he remembers sliding down glaciers in the Sierra Nevada mountains as a nine-year-old kid, backpacking with his dad. "When I became a parent, I took my own kids to the mountains, and we did the same trip. And the glaciers are gone!" he says. The more he learned, the more it kept him up at night. "The analogy I've used is, the house is on fire, and our children and grandchildren are trapped in the attic. So what are we going to do about it?" he says. As a city manager, there are, in fact, some things you can do. But they may be controversial. Steven Falk ended up in the middle of a battle over what gets built on some land right near the heart of his city. Falk takes me to a big parking lot, covering about five acres of land, right beside the Bay Area Rapid Transit station. This is where commuters take the trains to Oakland and San Francisco. This area is also close to shopping. One way to fight global warming: Build lots of housing right here, where people can live without driving cars and burning gasoline. Plus, multistory apartment buildings or condos generally take a lot less energy to heat and cool than single-family suburban homes. "It just makes all the sense in the world that this parcel should have a multifamily housing development on it," Falk says. But development is a really sensitive topic in Lafayette. There's a whole citizens' group called Save Lafayette that's been fighting against plans for more high-density housing. As a Lafayette resident named Martin Stryker told the city council at a meeting in June, "People have chosen to live in Lafayette for the quality of life, away from the city. ... I encourage city leaders and staff to sharpen your vision and to be stronger in protecting the interests of our citizens despite the pressures from the state and outside interests like developers." The city has actually approved hundreds of new housing units in the central downtown area in recent years. Falk is proud of that. But he wanted to move faster. Tensions came to a head this past summer over a new California law that lets BART go ahead and build housing on land that it owns near its stations, like that parking lot. Falk liked the idea. Lafayette's city council members, though, considered it a power grab by the state. They asked Falk to go to the state capitol and take a public stand against it. "I drove to Sacramento, not feeling good about it," Falk recalls. "I went into the Senate hearing room. I saw this line of speakers, and realized that I had to get up and speak against the bill. And that ..."
Falk's voice breaks. After a long pause, he goes on. "And that was the moment I knew I had to resign." In his resignation letter to the city council, Falk wrote that "it has become increasingly difficult for me to support, advocate for, or implement policies that would thwart transit density. My conscience won't allow it." The city made the letter public. Don Tatzin, who served on the Lafayette city council for 33 years and just stepped down as the city's mayor, expressed some sympathy for Falk's views. "I think it's good to hear voices that say cities need to become denser. Over time, that becomes accepted," he says. But local communities, he says, need to be in control of that process. "Having a regional or state government impose that, on something that citizens consider of importance, runs the risk of significant backlash, and I'm not sure it's wise." Tuesday was Steven Falk's last day on the job. At his final city council meeting, Tatzin and others gave speeches celebrating his accomplishments. No one mentioned climate change.